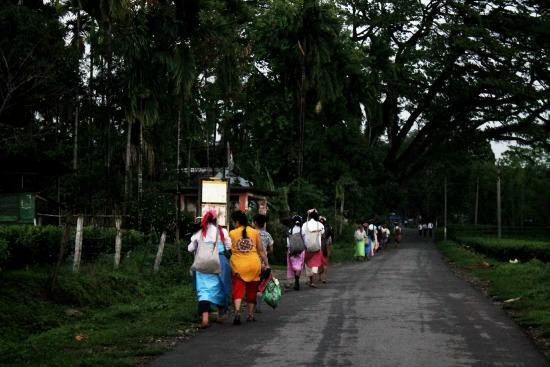 The management of Samsing Tea Estate in Jalpaiguri district announced suspension of work in the garden from today. Sources said the decision was taken after the garden office had been ransacked and two assistant managers were assaulted yesterday by local people, including workers, owing allegiance to the Trinamul-backed union. The estate in Metelli block, 65km from Siliguri, has 1,460-odd workers and is owned by Siliguri-based PCM Group. Garden manager Jayanta Biswas has filed a police complaint against four supporters of the Terai Dooars Plantation Workers' Union backed by Trinamul. Yesterday around 3pm, a temporary worker went to the garden office. "He needed the ambulance to take his mother to Malbazar. Those in the garden office allegedly did not give it to him," a source said. As the news spread, Bidhan Chhetri, Bhanubhakta Sharma, Sanju Bishwakarma and another person, all residents of the garden, went to the office with the worker and demanded that the ambulance be given to him. An argument followed between them and assistant managers Pradeep Biswakarma and Dipak Banda. "Both were beaten up and the garden office was ransacked. Worker Panam Bhujel's hand was injured while ransacking. We tried to send him to Malbazar for treatment but others intervened. With help of another assistant manager and a union leader, we sent him there," Biswas said. According to management sources, they have been paying the workers regularly. Later at night, the managerial staff left the garden and today, the notice was issued. "We were forced to declare suspension of work as situation was volatile and there was a risk of an attack," a management representative said. The labour department said it was yet to get the notice. "We had proposed that those involved in the attack face necessary action. The decision was taken in a hurry and is irrational," Anitraj Sunwar, unit secretary of the Trinamul union at Samsing said.